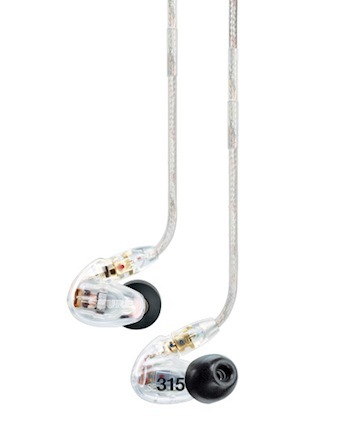 Shure announced their latest sound isolating earphones today (don’t call them earbuds), the SE315. The SE315’s are a single driver earphone with a full range of sound, and a detachable cable. Available in clear or black, the SE315 is based on the same design at the SE425 and SE535, and offers the same level of features at a reduced price. MSRP on the SE315 is $249, but you should be able to find them for $199.99 if you shop around a bit. 09.14.2010 – NILES, IL– Shure Incorporated today unveiled the new SE315 Sound Isolating Earphone, a single driver earphone featuring full range sound and a unique detachable cable. This earphone joins the available SE115, SE425, and SE535 in the Company’s award-winning Sound Isolating Earphone line, delivering enhanced sound signatures and premium driver technology in small, lightweight, universal-fit earphones. Available in clear or black, the new SE315 offers the superior sound quality, durability, and style for which Shure is known. Designed to meet the needs of live performance and personal listening, the SE315 Earphones are ideal for studio monitoring systems and are a perfect upgrade for portable listening devices. • SE315 Sound Isolating™ Earphones – The SE315 uses a Single High-Definition MicroDriver for full range sound with optimized low end. It is available in black and clear, and comes with an accessories package that includes three pairs of disposable black foam sleeves (S, M, L); three pairs of soft flex sleeves (S, M, L); one pair of yellow foam sleeves; one pair of triple flange sleeves; a premium carrying case; and a wax guard. • SE425 Sound Isolating™ Earphones – The SE425 uses Dual High-Definition MicroDrivers for accurate and balanced sound. It is available in clear and metallic silver, and comes with an accessories package that includes three pairs of disposable black foam sleeves (S, M, L); three pairs of soft flex sleeves (S, M, L); one pair of yellow foam sleeves; one pair of triple flange sleeves; a premium carrying case; ¼” (6.5mm) adapter; and a wax guard. • SE535 Sound Isolating™ Earphones – The SE535 uses Triple High-Definition MicroDrivers that deliver an incredibly spacious sound with rich bass. It is available in clear and metallic bronze, and comes with an accessories package that includes three pairs of disposable black foam sleeves (S, M, L); three pairs of soft flex sleeves (S, M, L); one pair of yellow foam sleeves; one pair of triple flange sleeves; a premium carrying case; ¼” (6.5mm) adapter; airline adapter; a volume control; and a wax guard. The earphones carry a two-year limited warranty and are available for purchase from select retailers. For a complete list of where Shure products are sold, please visit www.shure.com.